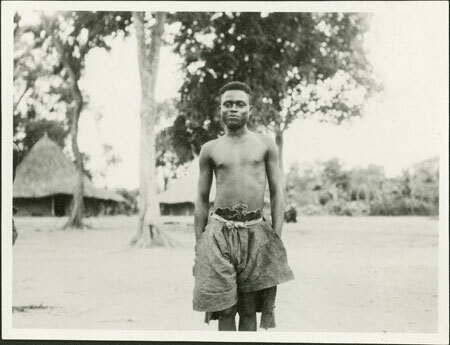 Portrait of a youth (unidentified) wearing barkcloth tied with fibre, photographed whilst visiting the public area of Prince Gangura's compound where his court of justice was located, called the ngbanga. Notes on print/mount - "46 (+138) EPA 585"
Morton, Chris. "Portrait of a Zande youth" Southern Sudan Project (in development). 03 Jan. 2006. Pitt Rivers Museum. <http://southernsudan.prm.ox.ac.uk/details/1998.341.585.2/>.